Donald Trump's Path Crossed with Emin and Aras Agalarov Years Ago. Here's When And How The back story of the Moscow pageant, the Russian father-son duo — one a billionaire developer and the other an aspiring pop star, the British-born promoter and the future American president. From left, Miss Connecticut USA Erin Brady and Donald Trump look on as Russian singer Emin Agalarov speaks onstage with his father Aras Agalarov during a news conference after Brady won the Miss USA 2013 pageant on June 16, 2013, in Las Vegas. In November 2013, Donald Trump took the Miss Universe pageant to Moscow, bringing his trademark glitz and glamour to a country that had never hosted a major beauty contest. Trump later boasted that he met a lot of important people at the pageant. They included the billionaire real estate tycoon Aras Agalarov, who is now figuring prominently in the investigations into the Trump campaign's ties to Russia. Here is a look back at how the Miss Universe contest came together and what happened there. British-born music promoter Rob Goldstone began representing singer Emin Agalarov, son of billionaire real estate investor Aras Agalarov. At the time, Emin was married to Leyla Aliyeva, the daughter of Azerbaijani president Ilham Aliyev. In a Facebook post from New York, Goldstone announced he would be attending the Miss USA pageant in June. He served as a preliminary round judge at the event. Emin Agalarov released a music video featuring 2012 Miss Universe Olivia Culpo. This collaboration led Golstone to meet with the head of the Miss Universe Organization, Paula Shugart, according to Mother Jones. "Fun meeting with Donald Trump," Rob Goldstone posted on Facebook. During the Miss USA pageant, Trump announced the location for the 2013 Miss Universe pageant: Crocus City Hall in Moscow, Russia. Trump was joined on stage by Aras Agalarov, president of Crocus Group, and his son. The elder Aras later told a Russian news outlet that Trump greeted him warmly, saying, "'Look who came to me! This is the richest man in Russia!'" Later in June, the Russian parliament passed a series of anti-gay laws. In an interview with Miss Universe co-host Thomas Roberts before the event in November, Trump defended his decision to keep the pageant in Moscow. Trump tweeted about the upcoming pageant. "Do you think Putin will be going to The Miss Universe Pageant in November in Moscow - if so, will he become my new best friend?" he wrote. Miss Universe took place at Crocus City Hall in Moscow, Russia. Emin Agalarov performed at the event. In an interview with Forbes, Emin Agalarov said Crocus Group, "may theoretically consider a possibility of building a Trump Tower as one of our skyscrapers." Emin Agalarov released his music video for "In Another Life." The video features him at a dull business meeting, daydreaming about Miss Universe contestants. His fantasies are suddenly interrupted by the man running the meeting, Donald Trump, who barks, "You're fired!" The pop musician would later tweet about the video, after a controversial dossier was leaked making allegations about Trump's Russia visit. Ivanka Trump visited Crocus City Hall in Moscow. Emin Agalarov gave her a tour. Emin Agalarov performed at the 2014 WGC-Cadillac Championship golf tournament held at Trump National Doral near Miami, Fla.
Trump told radio host Hugh Hewitt about meeting Russian oligarchs during the Miss Universe pageant. He said, "... two years ago, I was in Moscow. And a lot of the people, Hugh, they were there, and they had an amazing time. And they're terrific people. You know, I was getting along with them so great. I really loved my weekend, I called it my weekend in Moscow. But I was with the top level people, both oligarchs and generals, and top of the government people. I can't go further than that, but I will tell you that I met the top people, and the relationship was extraordinary." Rob Goldstone emailed Donald Trump Jr., offering up incriminating information on Hillary Clinton. "Emin just called and asked me to contact you with something very interesting," he wrote. Goldstone said the information came from the "crown prosecutor," an apparent reference to Russia's top prosecutor, Yuri Chaika. 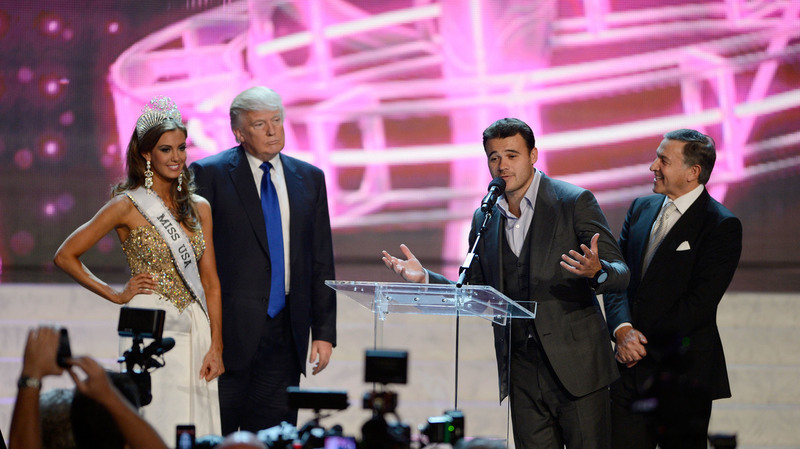 Throughout the campaign, Emin Agalarov and Goldstone supported Trump on social media. "You proved the entire world wrong, it's just incredible!" Emin Agalarov posted on November 10. Russian lawyer Natalia Veselnitskaya and a Russian-American lobbyist met with Trump Jr., then-Trump campaign chairman Paul Manafort and Trump son-in-law Jared Kushner. On CNN, Trump Jr. skewered the Democrats for accusing the Trump campaign of colluding with Russian hackers to release documents from the Democratic National Committee. "I mean, I can't think of bigger lies — but that exactly goes to show you what the DNC and what the Clinton camp will do. They will lie and do anything to win," he said. Goldstone posted a picture of Emin Agalarov, himself and Trump captioned "The A Team - headed to the White House!" Days after the election, Goldstone shared a picture of himself, Emin Agalarov and president-elect Trump that ran on Russian TV. The New York Times first reported the existence of the meeting with Trump Jr., Manafort, Kushner and Veselnitskaya. Trump Jr. published the email exchange with Goldstone on his personal Twitter account. Later in the day, White House principal deputy press secretary Sarah Huckabee Sanders reads a statement from the president: "My son is a high-quality person, and I applaud his transparency."